Today, I'm putting on my photographer elf hat. Yes, Elf hat. You see, during the holiday season I work at the mall as one of Santa's helpers, taking photos of children with Santa. I love it. Absolutely love it. I love the fantastic pictures as well as the ones that end up in books like Scared of Santa or on one of the websites that will pop up closer to Christmas where you can upload your very own creepy Santa photos. 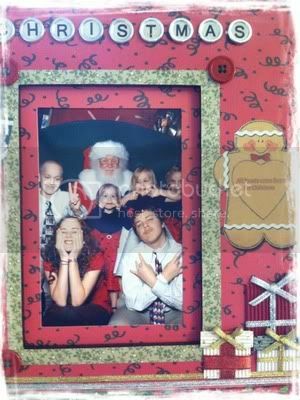 If you really want to do all you can to get the best Santa picture possible, there are a few things you can do to help your friendly Santa photographer. 1. Pictures before Thanksgiving. In some malls, Santa has already arrived! He's there as early as the first full week in November. Crazy, right? You're thinking Thanksgiving Turkey not Santa. That's exactly why this is the BEST time to get your picture. The lines are much shorter. Shorter line, happier kids, happier parent. Done and over with. 2.Frequent visits. Prime fear age is 12- 36 months. Unless of course, you're my daughter who finally would speak to Santa last year...She was 13. Bring a timid child by often just for a visit. Let her get used to Santa. Make Santa a familiar face. Some kids are going to scream no matter what. Once a little one starts crying, odds are, they aren't going to stop until they are completely away from Santa. And you need to decide what kind of perfect Santa photo you want: completely posed or completely natural. 3. Nap time. Please, for the love of all that is holy, do not bring your child in just before nap. Bring your child in just after nap time. Awake and happy. Not cranky. Cranky is not good. Even better, make Santa your very first stop. Don't do any other shopping. Get the photo done before everyone is cranky, including Mom, Dad, Grandma and the elves. 4. No candy in line. Sticky fingers. Sticky faces. Sticky Santa. 5. If you wait until the lines get long, bring a friend to hold your spot so you can escape for potty breaks. We've all been there when you get just to the front of the line and "I need to pee!" And then you're forcing the picture with a kid who needs to be elsewhere. Best case scenario, the potty dance doesn't interfere with the pictures. Worst case scenario, Santa has to change his suit. A special note for babies: let them sleep. Some of the sweetest Santa photos I've seen are Santa snuggled up with a sleeping newborn. Melt your heart, stick that on a Christmas card kind of photo. 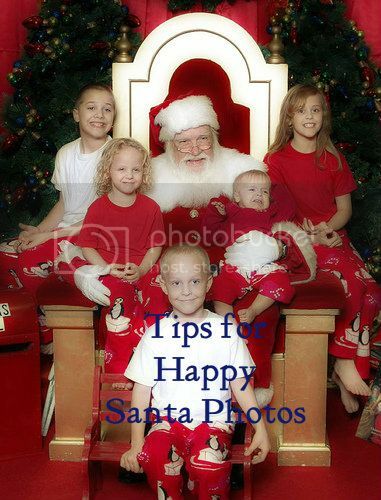 The same rule you use at home of Never Wake a Sleeping Baby also applies to Santa photos. We're still working out the details on our photo this year. I mean, it's hard to top that awesome photo from last year! PS...don't forget to link your Cinnamon recipes with Iron Chef Mom this week at Growing up Gabel. Next week, our secret ingredient is Sweet Potato, so get your thinking caps on! Thanks for partying with us this week at Keep Calm & Link Up!! Happy Friday!! Great tips. I attempted to get some photos done yesterday. Success for Mr 1. But Mr 3 stamped his foot and burst into tears so I didn't push the issue. I'm unsure if he was scared, or just a little overwhelmed. Might try again next year . . .
We take the grand kids every year to get their pic made with Santa. We even go to one specific mall because their Santa looks like the real deal. My favorite pic is the one of my youngest grandson asleep in Santa's arms and Santa is using the symbol (finger to lips) telling everyone to be quiet. We do go early and never at nap time - a disaster waiting to happen. Thanks so much for sharing these helpful tips with Throwback Thursday.